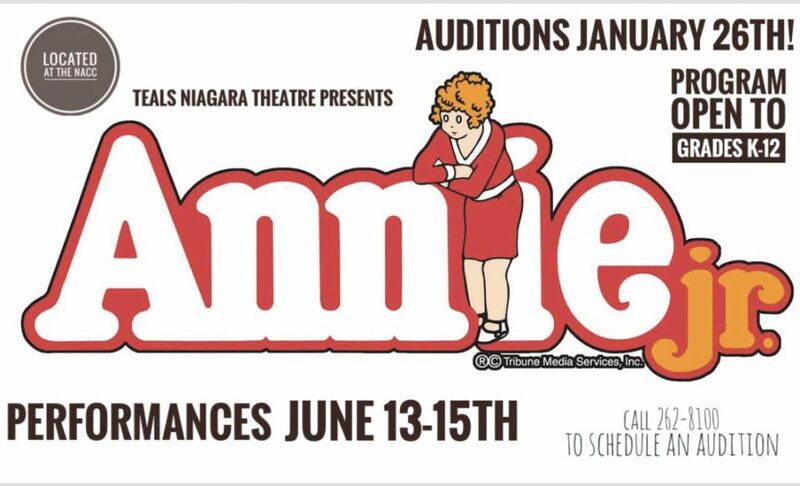 Teals Niagara Theatre, an award-winning (Broadway World Regional Award for Best Musical and Best Actor in A Musical) Youth Theatre program in Niagara Falls, is holding auditions for Annie Jr. On Saturday, January 26th. Show dates will be June 13, 14, and 15th. Rehearsals are held on Sunday afternoons between 4-8pm. Program is open to students in grades K-12. There is a fee to participate in the program but students may sell program ads to offset the cost. Details are included in the audition posting on signup sheet. Click here to sign up for an audition spot. Auditions for Teals Niagara Theatre’s production of Annie Jr. will be held on Saturday, January 26th from 11:30am-2:30pm at The Niagara Arts & Cultural Center Room 132. Callbacks will be planned for the following day on Sunday, January 27th from 4-7pm. Performances will be Thursday, June 13th at 7pm, Friday, June 14th at 7pm and Saturday, June 15th at 6pm. THE STORY: Based on the popular comic strip and adapted from the Tony Award-winning Best Musical, with a beloved book and score by Tony Award-winners, Thomas Meehan, Charles Strouse and Martin Charnin, Annie JR.features everyone’s favorite little redhead in her very first adventure. With equal measures of pluck and positivity, little orphan Annie charms everyone’s hearts despite a next-to-nothing start in 1930s New York City. Annie is determined to find the parents who abandoned her years ago on the doorstep of an orphanage run by the cruel Miss Hannigan. Annie eventually foils Miss Hannigan’s evil machinations, finding a new home and family in billionaire Oliver Warbucks, his personal secretary, Grace Farrell, and a lovable mutt named Sandy.